STORY OF MY LIFE: Harding's book takes us into the world of a public servant, successful attorney and patriarch. YOU’D be hard-pressed to find a more devoted family man than Oswald ‘Ossie’ Harding. 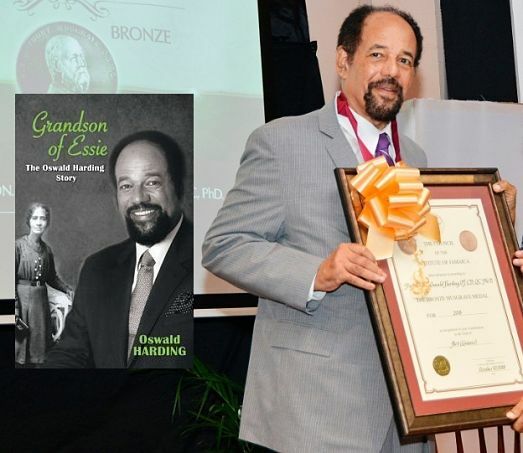 As expected, several of his close relatives were on hand at the Institute of Jamaica (IOJ) last October to see him receive a Musgrave medal for outstanding contribution to Jamaican life, among a bunch of fellow stalwarts like Jean ‘Binta’ Breeze and Mervyn Morris. At the event, his son Jeremy told TALLAWAH that no one was more deserving of such a prestigious honour than his old man. Longtime admirers, especially those readers who’ve picked up a copy of his just-published autobiography, Grandson of Essie (LMH Publishing), will agree without hesitation. Packing 230-plus pages, the book candidly sets out the journey of Oswald Gaskell Harding, in his own words. A patriot and public servant who became well known to Jamaicans as a stalwart of the Jamaica Labour Party, Justice Minister, Attorney General and Senate President. In fact, Harding’s stint from 1977 to 2002 sets him apart with the distinction of being the politician with the longest continuous tenure in the history of the Jamaican Senate. And that’s not even half of his story. In addition to highlighting his public and political persona, the memoir delivers chapters centred on his early years, sojourns abroad (in Canada and Mexico, in particular), not to mention his experiences in the world of academia. And we also meet the committed husband, father and grandfather, as the book delves into his life at home with the family. Did we neglect to mention that Harding is also a renowned art collector, with a world-famous collection of ceramics? To wit, the 2018 Musgrave medal he received was in tribute to his exploits in the arts. These days, Harding (who still has a law practice in his native St. Andrew) remains a patron of the arts and dedicated collector, work he took up a notch when he retired from politics in the early 2000s. Still passionate about academics, his retirement allowed him to read for a PhD in philosophy from Mona’s University of the West Indies campus.